The North Face Nuptse is the outdoor giant’s go at a cool, urban down jacket. And they’ve pulled it off spectacularly. The shiny exterior has large baffles, which bring to mind the streetwear puffies of the 1990’s, while the ethically sourced down in the interior means you can feel confident that you’re putting your money in a respectable product. Because of the jacket’s good design, simple yet sufficient features, and outstanding comfort, we’re awarding the Nuptse our Classic Pick down jacket for the Urban Hiker. With a boxy, relaxed cut and enough down filling to make a cloud envious, The North Face Nuptse is both fashionable and absurdly comfortable. This competitive spot — a Classic Pick down jacket for Urban use — has been held previously by the REI Magma 850. REI Is in the process of updating this piece, and while it’s still great, we find the oversized baffles, comfy fit, and excellent style of the Nuptse gives it a leg up for most people who want an urban jacket. Weight 22 oz. (625 g) This is heavy for a down jacket, which means lots of warmth and burly fabric. Down Quality 700-Fill Solid down fill quality. Not the highest end or lightest out there, but still good. Down Type Goose Down RDS The down is RDS, which means it’s certified by the Responsible Down Standard, an organization that assures humane processing of geese. Fill Weight Not Listed Unfortunately the fill weight is not listed. This would help to better determine how warm the jacket is. Our testing shows it’s decently warm, but cut small around the hips which lets in air. Shell Fabric 40D-50D Nylon Very thick fabric used in the Nuptse. DWR Treatment Yes The shell fabric is treated with DWR and works well. Number of Pockets 3, Zippered Solid zippered hand pockets (that are insulated), and an internal zippered stash pocket. Stuffs Into Itself Yes (sort of) This jacket technically stuffs into its own pocket, but it’s difficult and probably not worth it. Adjustable Hood Yes The hood as two adjustment toggles and can be rolled up easily and stuffed into the collar. It’s not insulated. Adjustable Waist Yes The hem cinch can be tightened to retain warmth. Hood/Jacket Option Hooded All the Nuptse “jackets” have hoods which can be stuffed into the collar. Gender Men’s, Women’s Jackets for all genders. Sizes Available XS-XXL Plenty of sizes. Manufacturer Warranty Limited Lifetime Warranty The North Face has a solid lifetime warranty. If any parts fail, send it in. Retail Cost $249 A solid price for an excellent down jacket for around town and camp use. You’re paying for excellent zippers, durable fabric, and a brand name and design. As a down jacket for the Urban Hiker category, my first concern was: would I use such a big coat on my morning bus commute? And boy did I! There’s nothing quite so enjoyable as waiting for the bus in the Pacific Northwestern cold swaddled up in the Nuptse. Throughout this review you’re going to hear me talk a lot about the comfort of this jacket. And I want you to know that even after reading this entire review you’ll still be amazed at how comfortable the Nuptse is. It’s just that good. The North Face Nuptse: beyond comfortable and puffy in any scenario. The Nuptse’s warmth and hilariously big shape made me inclined to reach for it every time I was out walking around town. Furthermore, because it’s cut with what The North Face calls a “relaxed fit”, the jacket is roomy enough to throw over any work attire I wanted. The real joy here is that because the puffy is intended to be fashionably boxy, I never felt like I was drowning in material, like can happen when you accidentally get too large a size. In the Nuptse, that big size is the whole point. You can layer nearly anything under the Nuptse, and the giant baffles of down are engineered for maximum comfort. I knew I loved this jacket from the moment I put it on. Simple as that. The fit is boxy and comfortably roomy. The color is great. And there is so much down stuffed into a single jacket that I felt insulated from anything the world could throw at me. The Nuptse is capable on most adventures, including the ultimate puffy warmth for any cold car-ride to the trailhead. I found myself reaching for this jacket again and again for adventures around town or even for chilly mornings in the car on the way to the mountains. The Nuptse came to feel like a comfy pair of sweatpants that you can’t wait to throw on at the end of the day. The Nuptse’s 30-50D exterior is crammed full with soft 700-fill down. And for all you animal lovers out there, The North Face ensures that their down is certified to RDS standards. Add in the fact that the jacket is made from post-consumer recycled content and you’ve got a comfortable jacket that you can feel good about buying. All the down, all the puff. 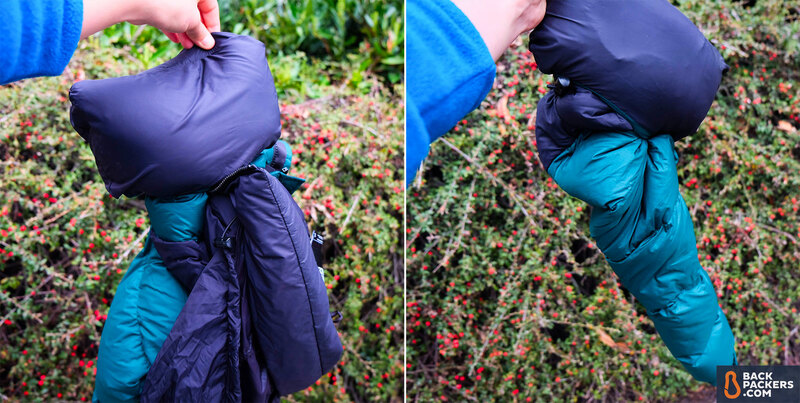 The features on the Nuptse are a little light on the ground, but nothing key is missing. There is a standard center zip closure on the front of the jacket, but no storm guard so it’s not super waterproof. The cuffs adjust with Velcro tabs, and a bungee cord cinches the hem. Up top you’ve got an uninsulated hood. Finally the Nuptse claims to pack into its own pocket. And while this is technically true, getting such a large jacket into such a small space was more effort than this reviewer was willing to put in. In fact, I managed to get the entire jacket into its stow pocket exactly once. The Nuptse’s interior zippered pocket works well for stashing small items. Not so much for stuffing the jacket though. This jacket’s retro styling makes me emotionally uncomfortable because it informs me that I was alive at a time which is now considered retro: 1996. That’s uncomfortable. However, the actual jacket is like being swaddled by the soft, downy arms of the Michelin Man. You wanna feel like you’re walking around in a cloud? I sure did in the Nuptse. Compared to the tissue-paper-thin nylon that is used in most backpacking puffies, the Nuptse’s 30-50D fabrics feel positively robust. That being said, maybe don’t climb through any rose bushes. The fabric is thicker than most puffies, the zippers are YKK, and have decent pulls. 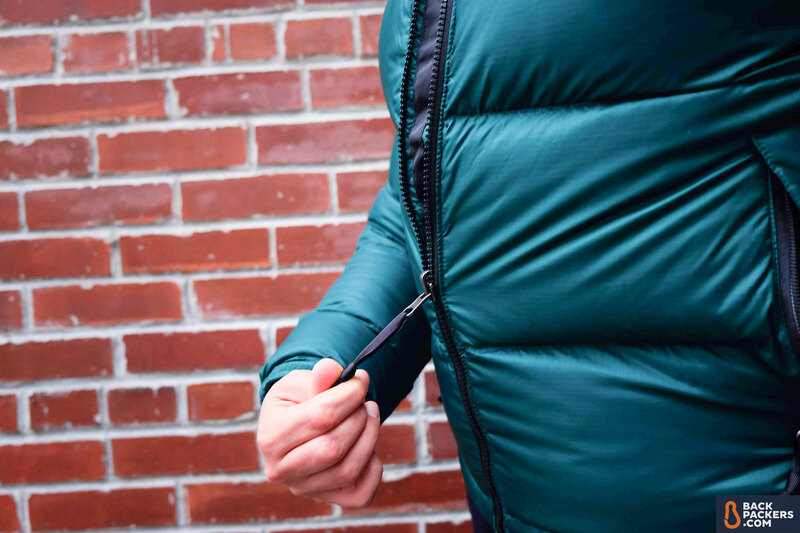 Overall well constructed — but still a down jacket, so don’t take a scissors to the thing. Chilly mornings in Seattle typically dip no lower than the low 30’s. At that temperature with a standard work outfit on I would be perfectly warm while waiting for the bus. At lower temperatures the jacket’s short torso, which hit me just above the hips, would start to feel drafty. Sorry Nuptse, but packable you are not. The jacket austensibly fits into a pocket sewn into the interior, but the effort required to do so meant that I rarely bothered. Then, in both my office and my front hall the jacket took up a lot of space just hanging there. You can try to stuff it in the interior zippered pocket, but it’s not worth the time. This jacket is cut on the roomy side, but not excessively so. For most of my adult life I’ve been a pretty consistent size medium across most brands, and the Nuptse was cut a little bigger than most. I actually like that feature for a jacket like this because I could easily layer it over a blazer for the office, making it ideal for a commute. If I was going to pick a fight with this jacket it would be about the hood. It’s flimsy, it looks a little silly, and it’s not insulated (another reason I deducted stars for warmth). However, the hood is easily concealed by rolling it into the collar. Meaning you won’t have to look at it, but it will be there if it starts raining. On the other hand, if it starts snowing you’d better have a hat. The Nuptse has a very lightweight hood for being such a puffy, robust jacket. It’s not insulated, so won’t do much to increase your warmth. That said, it’s thin and easy to pack away, so won’t cramp your style when not in use. The Nuptse Jacket from The North Face is a downy ball of retro nostalgia. The luxurious comfort of the jacket is almost enough to make you forget about your childhood reaching retro status. 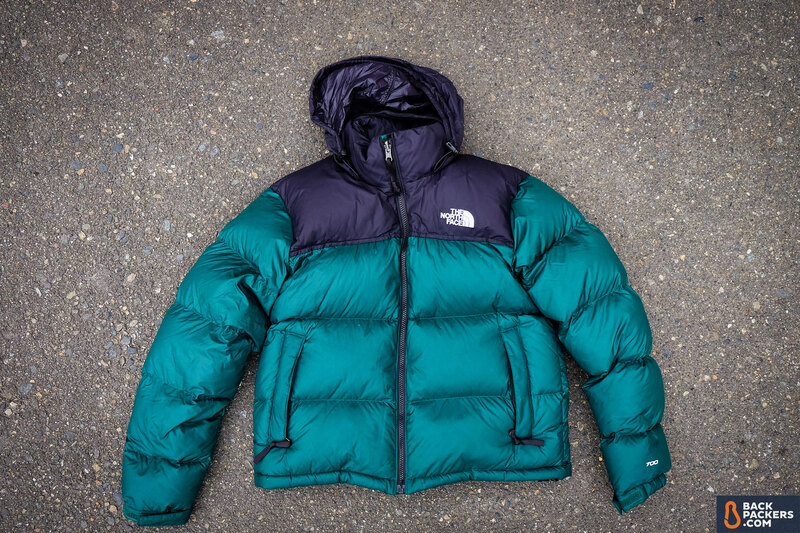 We tested a women’s North Face Nuptse down jacket, specifically in the “1996 Retro” line. This jacket is the same for all genders, except for fit and color. The North Face has also offered the Nuptse in slightly different styles over the years, sometimes with slimmer baffles. The Retro version is current, and what we recommend. It also comes as a vest. Compare The North Face Nuptse prices below.